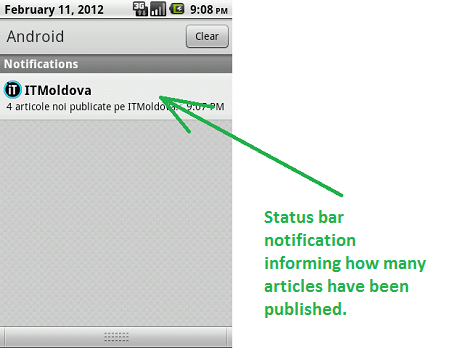 ITMoldova – My First Android Application. Although it has passed awhile since I published my first android application on Google Play, and I published already my second Android App meanwhile, I decided to write about it as well, as almost all my posts from this blog till now are findings and experience gained while I was working on ITMoldova app. ITMoldova.com is a Moldavian site that provides daily IT News for romanian speaking people. The main purpose of Android application is to check the RSS feed of the site if there are any new articles. If it turns out that new articles have been published on the site, then launch a status bar notification and notify the user. And of course, the user is able to see the most recent articles and read them right from his device. The application settings provides the ability to set up the desired interval of time, when the application should verify the RSS feed, plus the possibility to Turn On or Off this feature. Do you want to build your own RSS Reader Application? After reading (and exercising) the above tutorials, you should be able to build your own Cool RSS Application :). Please visit the Android Tutorials page for more Android tutorials. great apps guys, This is the your latest application?? This application is only for Rumanian? there not for Indonesian?? Hello Dear i have developed an application but that is not showing my current location. and i also wanted to get address of a point but it is also not working. i can show you all my coding. Would you like to help me in solving my problem. I stuck in this problem 2 weeks ago but still not found any reasonable solution. I have always wanted to make my own RSS feed app. Great resources! Man, props to you for the comprehensive documentation of your experiments (both successes and failures)! I don’t have an Android Phone right now (stuck with a 3GS for now) but if I do I’ll definitely want to get my hands dirty creating some applications, and your blog will no doubt be at the top of my list of resources. Thanks for the wonderful tutorials you have provided at your blog! Cheers!